Think about a beach. What comes to mind? Miles of soft white sand lapped by gentle turquoise waves? Sun on your skin? A parasol moved by a soft breeze? Making sandcastles; eating ice cream; paddling in the shallows; sunburned shoulders? Sounds lovely. But some of us yearn for a different scenario. Our beach is wide and empty. There are miles of soft sand, but ours is pounded by rolling surf. The sun is shining, but there’s a chilly wind so you need to wrap up well. There still may be ice cream, but a hot chocolate at The Dunes Cafe is more the order of the day. And while cheeks and noses may turn red, that’s a rosy winter glow. Yes, some of us prefer the beaches in winter: when everyone has gone home and there’s often only us, our dog and the seagulls for company. At this time of year there may also be seals. Hundreds of them come ashore to have their pups at nearby Horsey between November and February (there’s lots about them in previous blogs) and the sight of them basking in the winter sunshine is a rewarding end to a bracing walk. Dogs have to be controlled near them, but general beach restrictions are lifted outside the summer season so our furry friends can run, chase balls, jump and swim to their hearts’ content. Just make sure you take plenty of poo bags to clean up – those rules always apply! Just walking along, enjoying the peace and solitude is real balm for the soul. Some plug in to music, some find a sheltered spot to sit and watch the world go by, others stride out purposefully with their eyes on the horizon. What are they thinking about? Big business decisions? Family problems? Whether to have marshmallows or a flake in their hot chocolate? Who knows? What we do know is that studies have shown that the seaside is associated with calmness, enjoyment and refreshment – whatever the time of year. Just watching the rhythm of the waves is calming, and it has a soporific effect on a busy brain. Searching for shells or seaglass is a good way to while away a stroll, and keep an eye out for stones with holes in – they’re considered lucky in coastal villages and if you hang them outside your home they will keep witches away! We are lucky in Winterton because as well as the beach we have miles of dunes to walk in, so when the wind really is whistling off the North Sea, there’s a bit of shelter. We particularly like it when there’s been a hard frost – or even snow! The white against the sand is beautiful. Sunrises and sunsets are particularly stunning in winter, and those big Norfolk skies with brooding clouds building over the sea are just magnificent at all times of the day. And as with any walk, if there’s a good pub with a roaring fire at the end to warm you up and get those fingers and toes tingling it’s even better. 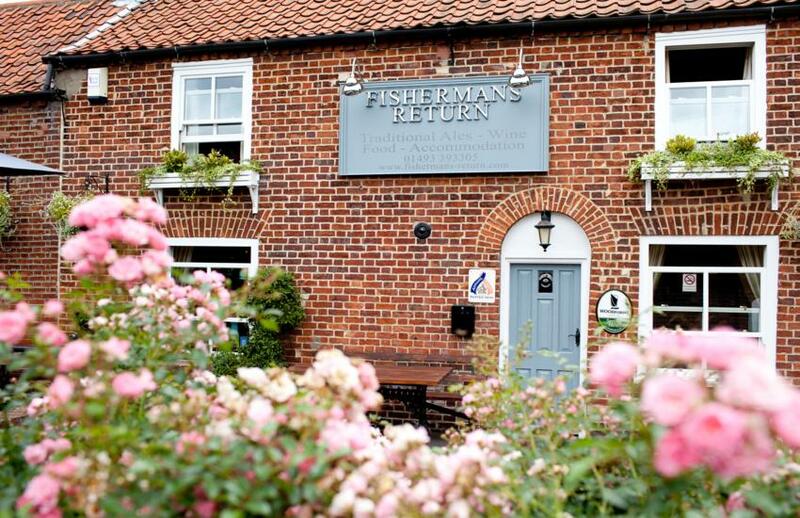 We are spoiled around here with The Fisherman’s Return in the village and the Nelson Head at Horsey where you can thaw out with a reviving brandy, mulled wine or hot toddy, or you can tuck into a hearty meal followed by a rib-sticking pudding. Well worth the walk. If you want to venture further afield there are plenty of other beautiful beaches you can drive to. 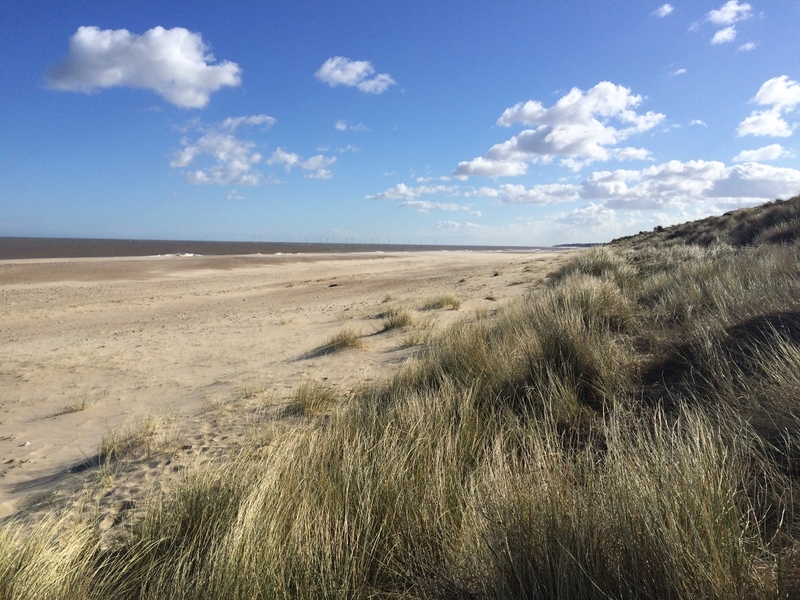 Beaches from Holkham and Wells down to Gorleston and Southwold are very different in winter. The sands are often deserted and the towns are much quieter than in summer, so you can have a proper look around. So don’t just hole up because it’s a bit cold or looking like rain. Get out there. Hats, scarves, gloves and thick socks have been waiting for this opportunity! Fill your pockets with sweets (maybe even a hip flask) and put your best foot forward. If it’s breezy, we recommend walking into the wind on the way there so it will be at your back and give you a push home when you’re tired! You never know, winter might become your favourite time to go to the beach, too.